Today’s beat was at least easy to find, one of the parking areas demarcated pretty much by a suspension bridge across the river. 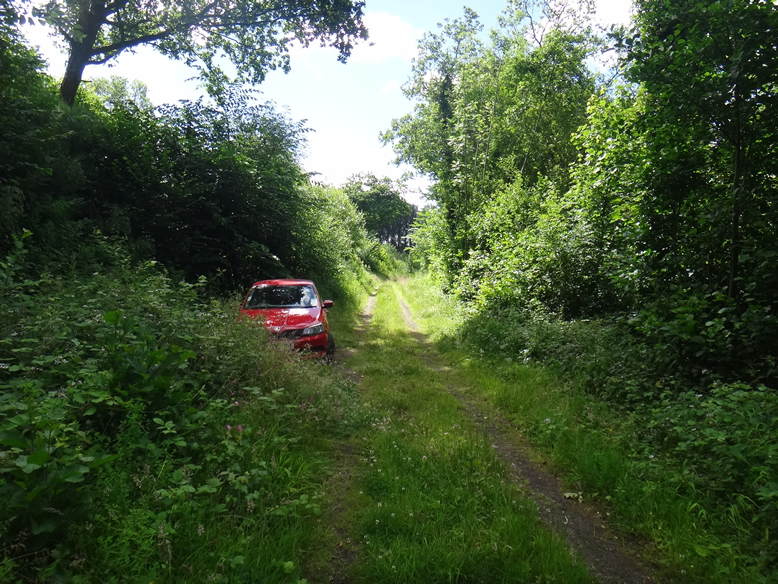 I managed to locate that without resorting to the cell phone GPS, from there was able to find the specified gate and the old railway track down which I was instructed to drive. The Llanstephan suspension bridge makes for a fairly substantial landmark. The sort of riverside track with grass growing high in the middle and suitable only for 4 X 4 vehicles and hire cars. I don’t think one would gladly drive there if it was wet, but it isn’t wet, in fact it isn’t near wet enough and the rivers are low. That makes wandering many of the beats relatively easy, but on contrast can mean that the fishing is tricky. Parking is along an old rail track, via a gate and combination padlock. Suitable for 4 x 4 vehicles and hire cars only. Off the track there were “steps down to the river”, that may provide some indication of the steepness of the sides. A very different type of water to that which I am used to fishing, to my mind a massive river even in the reduced summer flows. 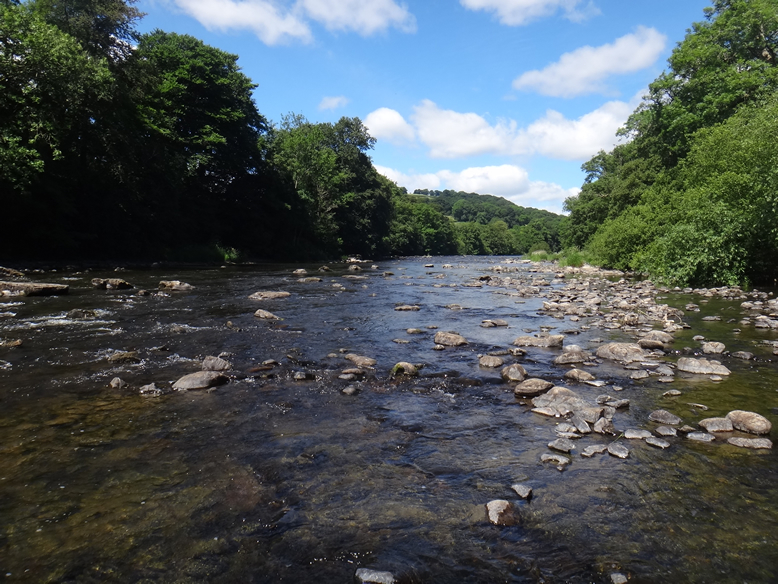 This is a very wide section of the Wye, with a great deal of near un-wadeable bedrock which is not only seriously uneven with fissures and pot holes in it but equally very very slippery even with the correct footwear. All in all, from the perspective of someone used to more intimate and more easily waded streams the river is quite intimidating. Not least because it is difficult to know where to start fishing with so much water in front of one. I opted for a shallow riffle section in the lower part of the beat where there seemed like a reasonable chance of finding fish and where the wading wasn’t quite so tricky with a smattering of small boulders and gravel on the bottom. The smooth sheet rock sections, as mentioned, are dreadfully difficult to negotiate. There was a nasty and troublesome downstream breeze on the day I fished and that made the angling all the more difficult. It isn’t so much that one cannot cast into such a breeze, stiff though it was, but more that one cannot maintain control and get the presentation that one might otherwise be able to achieve. 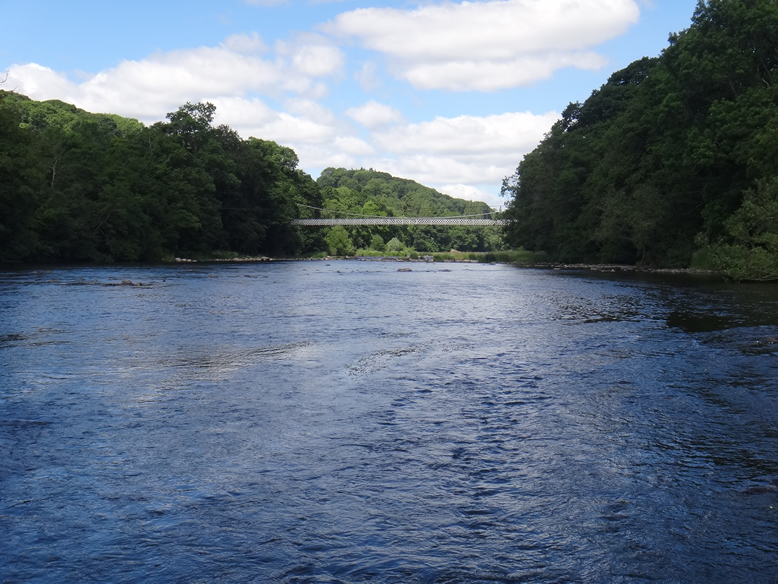 A feisty downstream breeze causes all manner of problems well beyond casting. One notices every single toggle and zipper on one’s fishing vest, because now every attempt at checking the fly or adjusting the leader results in the line being wrapped around some protuberance or other. Standing in the stream , struggling with 7 x tippet snagged in zippers and Velcro closures , it wasn’t the first time that I wondered if people who design fishing vests have actually ever fished. I have a new shorty vest, which is better than my previous one, which sported those hard foam formed pockets that became all the rage. I think that perhaps William Joseph started the trend and it became all the fashion. That vest I grew to strongly dislike, difficult if not impossible to pack into a bag when walking home and on the river, even if the pockets were empty, one felt rather like Mae West after a breast augmentation. At least the new shorty vest isn’t as cumbersome, but I am going to have to do some surgery on all those zip toggles. They exhibit the same affiliation for nylon as most of the bank side herbage here. In other words, any loose piece of leader will find its way around something. Undeterred however I set about searching out fish in the riffles, fishing with a long leader and a dry and dropper combination I was able to pick up a number of trout and grayling in short order. The fishing remained like this for an hour or so and then seemed to die off. Whether the cold wind was putting the fish down or whether it was the bright sunshine I wasn’t sure. But things went very quiet and after a pretty good opening session I was struggling to find fish on the dry or on nymph rigs. I did catch both brown trout and grayling , but pretty much all in the earlier part of the morning. After much hard work and looking over other sections of the beat I decided to take a break and perhaps return later, I had a suspicion that I had been getting things wrong and that I should rather have been on the water in the early morning or late evening. It was the longest day of the year when I fished , which means both extremes, dawn and dusk occur almost eighteen hours apart. To be on the water at dawn I would have had to be driving by 3.30am, to stay until dusk would have seen me out at 10.30pm. 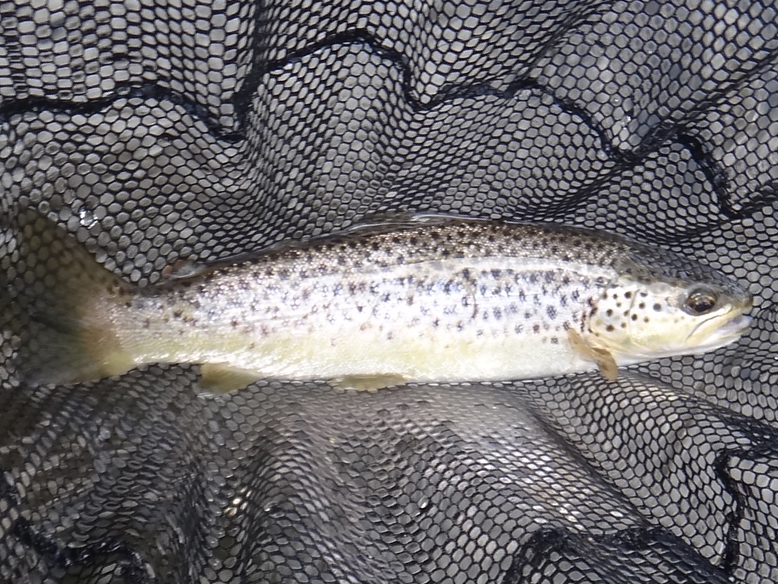 I resolved to stay out late and see what happened, and sure enough as the light faded and that niggling wind abated a little there was a considerable mixed hatch with flies over the water in near blizzard proportions. For some reason however, even then, not a fish moved, I had no idea of why, and perhaps again it was that chill wind doing the damage but one would have imagined the river coming alive with action. One interesting hypothesis and one we have discussed related to some sections of water I fish in SA, is that the fish don’t like staring straight into the setting sun. It is tricky to prove if that is the case, but the section I was fishing and where all these insects were hatching faced directly into the sunset and the glare was quite blinding to me. Could it be that fish either don’t like to face into a low angled setting sun or perhaps that they can’t see well in such circumstances? I think that this is something worthy of more consideration. Tomorrow I shall be on the Usk on a section that shouldn’t be facing the setting sun, perhaps if there is more activity on that section in the final hours of the day it could add credence to the theory. I ended the day with something in the region of 25 trout and 10 grayling, but nothing of notable size and I worked far too hard for them. Or put more correctly I worked far too hard after I had caught most of them, the first two hours of my fishing was really about it and I raised or hooked very few fish after that. Of all the waters I have fished during my stay this would probably rate as the least enjoyable, perhaps it was just the day, that niggling wind or maybe I was just out of form. It was however hard work and I fished for far too long , most likely at the wrong time of day.